Current medicines mostly kill the malaria parasite at the blood stage because this is the stage in the parasite’s lifecycle that leads to symptoms. To eradicate malaria, however, we must also stop the parasite being passed on to the next person via mosquitos. To do this we need medicines that can kill the parasite at multiple points in its lifecycle. MMV and partners have completed a pioneering comparative analysis of all currently available and in-development antimalarials in terms of the stages they target in the parasite’s lifecycle. This information provides many of the missing pieces of the puzzle needed to develop future medicines to help defeat malaria. For the last 2 years, Prof. Robert Sinden at Imperial College London has been working with MMV to turn basic biology into knowledge to underpin the development of new antimalarials. 1. What’s the focus of your work and how did you get involved in the malaria lifecycle project? For the past 40 years my lab has been studying the cell biology of the sexual and transmission stages of the parasite. We really want to know what makes the parasite tick – to understand its absolutely exquisite biology. Unraveling the mysteries of the parasite has been an absolute delight. This knowledge really put us in a good position to develop assays* with which to screen the molecules. 2. How did you determine which molecules target the sexual stage in the parasite’s lifecycle? What we did was to develop very high content biological assays, (in essence a replica of the biology of the parasite during the sexual stage) adding each of the 50 compounds one by one to the assay. In this way we could see exactly which drugs interrupt the normal biology at these stages. 3. Where should we be targeting transmission-blocking medicines in the lifecycle? 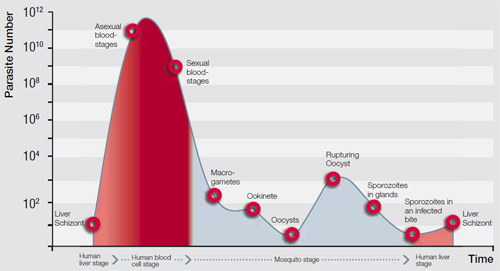 Theoretically, the most efficient stage to target is early in the parasite’s lifecycle when it converts from an ookinete to an oocyst, as there are as few as 10 parasites present at this stage in the mosquito (see graphic below). This figure can increase to as many as 1011 parasites once a person is infected, so attacking the parasite at this stage – as it passes from man to mosquito – could make a considerable difference, both on the efficiency of impact and in reducing the potential development of resistance. The challenge, however, will be delivering the drug, as this stage occurs in the mosquito and not in the patient. 4. Now that a comprehensive collection of 50 molecules have been screened, what’s next? The first key thing is to scale-up the assays so that they can screen larger numbers of compounds. This would allow them to be applied much more widely and not just in the research community but also in the pharma industry. I believe that pharma has now recognized the need to enter this area and this is something that must be encouraged as I truly believe this is how we are going to make the biggest impact on the parasite. The second step will be to test each drug against all the other stages. In this way we can move forward in the light of full knowledge of how the drugs work. 5. MMV has benefited a lot from your experience – how was it to work with MMV? MMV was one of the first organizations to recognize the need to understand the basic biology of the parasite in response to the eradication agenda. This insight was refreshing. The complementary skills within MMV and here at Imperial have led to a fruitful collaboration of mutual respect. *Assay: a procedure to test or measure the activity of a drug or biochemical in an organism or organic sample.